The bond between the members of a bomber crew was intense and one can sense their spirit in this photograph. It was taken on 29 January, 1944 of a No. 44 Squadron Lancaster crew. but was destroyed while attempting a crash landing. All aboard were killed. The operational life of this aircraft (ND514) was nine days. Quentin Snow (mid-upper gunner), Bernie Soper (bomb aimer), Bert Wright (pilot), and Bob Bateman (flight engineer). Five of the crew were serving together on a second tour when hostilities ceased in May, 1945. Mr. Snow, of Murwillumbah, Australia, donated the photograph. 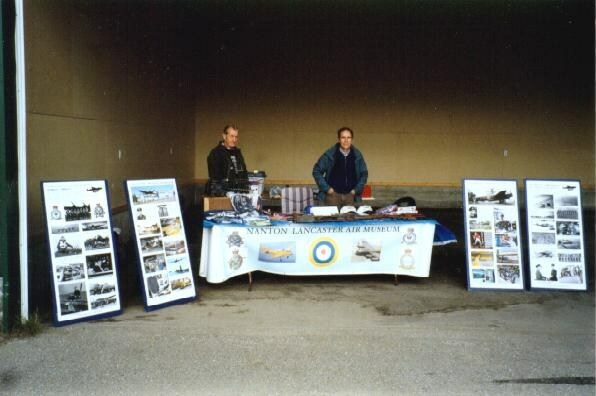 He served with the Royal Australian Air Force and is currently a member of the Nanton Lancaster Society. 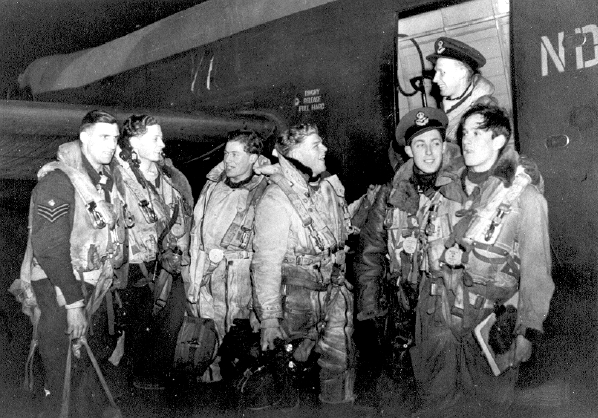 A Lancaster crew numbered seven – the pilot, flight engineer, navigator, wireless (radio) operator, bomb aimer/ front gunner, mid-upper gunner, and rear gunner. Invariably all were very young, a man of twenty-five would likely be referred to as the “Old Man” or “Grandpa.” They were of different ranks, came from all walks of life, and often from more that one country. However, they quickly bonded together to form a very special, tightly-knit group. This camaraderie was crucial to maintaining morale and efficiency in the air. Most felt that their crew was one of the best in Bomber Command. They generally spent many of their off-duty hours together as well as the first day or two of a leave. The bomb-aimer’s compartment was situated in the front of the aircraft at a level below that of the main cockpit. Lying on his stomach and looking through the bombsight out the large perspex blister, the bomb-aimer would guide the aircraft to the target and release the bomb load. 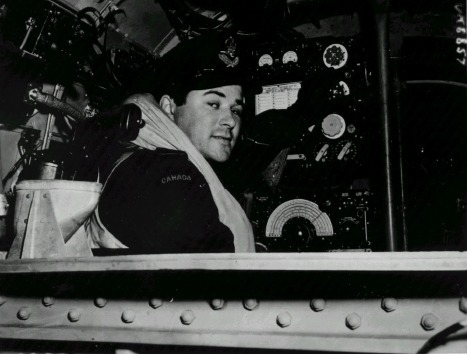 As well, the bomb-aimer was responsible for operating the front gun turret positioned directly above him, although this was not necessary on most operations. Regardless of rank, the pilot was always in command of the aircraft. Behind his head was the only piece of armour plating that a Lancaster carried.